Is it safe to use untreated greywater to irrigate vegetables in my backyard? Barker, F. and O'Toole, J. 2019. Is it safe to use untreated greywater to irrigate vegetables in my backyard? In: J.B. Rose and B. Jiménez-Cisneros, (eds) Global Water Pathogen Project. http://www.waterpathogens.org (S. Petterson and G. Medema (eds) Part 5 Case Studies) http://www.waterpathogens.org/book/is-it-safe-to-use-untreated-greywater-to-irrigate-vegetables-in-my-backyard Michigan State University, E. Lansing, MI, UNESCO. to assess if simple control measures are sufficient to reduce risk to acceptable levels. This study took place in Melbourne, Australia where household greywater reuse is common, especially during periods of drought. Greywater can be collected from the shower and laundry and is most often used without any treatment. Household greywater is typically used for outdoor irrigation, including vegetable gardens; however, greywater can be contaminated with enteric pathogens that pose a risk to human health, particularly when used to irrigate food crops such as salad vegetables that are eaten raw. Figure 1. Site location – Melbourne, Australia. This study looked at the risk from norovirus, which is the most common cause of community gastroenteritis in Melbourne. 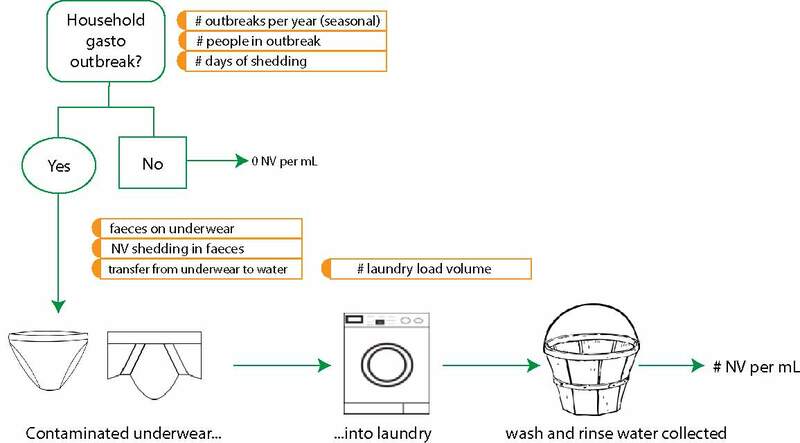 In the absence of water quality data, this study demonstrated how to use first principles and available published scientific data to estimate norovirus concentrations in laundry water. The annual disease burden was then estimated for people who eat greywater irrigated lettuce. This study found that the risk associated with the use of untreated greywater for irrigation of lettuce meets the health risk target when using either the median or the 90th percentile values of disease burden. The use of control measures, including a 2 day withholding period and produce washing prior to consumption, reduced the level of risk but additional measures would be required to meet the health target if using 95th percentile values of disease burden. This case study demonstrates how scientific data can be used to estimate water quality in the absence of local data. It also illustrates the importance of being clear and transparent about the use of statistics (e.g. median, 95th percentile, etc.) as they can significantly impact the assessment of “acceptable” or “unacceptable” levels of risk. Household use of greywater has become more common, particularly in arid and semi-arid regions of Australia. During severe drought conditions where domestic water restrictions severely limit outdoor tap water use, many Melbourne households turned to the use of greywater to irrigate their gardens with greywater typically collected from showers and washing machines. While greywater is often thought to be relatively harmless, and is typically used untreated, it is well-established that greywater can contain faecal material from shedding during bathing or transferred from towels and clothing in laundry water. Norovirus, which is the most common cause of community gastroenteritis in Melbourne, is transmitted faecal-orally and can survive in water. It has a low infectious dose, a high shedding rate, and high persistence in the environment, and previous studies have demonstrated potential waterborne transmission in drinking water and recreational water. The use of greywater for household irrigation is likely to remain a common practice during periods of drought in Australia. Therefore, it is important to determine if the use of greywater for irrigation of food crops is safe, in order to provide guidance and recommendations for households. The aim of this case study was to estimate the level of risk associated with household greywater reuse for irrigation of lettuce eaten raw. determine if simple control measures are sufficient to reduce risk to acceptable levels. Hazard identification: Norovirus was selected as it is the most common cause of community gastroenteritis in Melbourne. Exposure pathways: Indirect ingestion of untreated greywater through consumption of irrigated lettuce. Health outcome: DALYs lost per person per year was selected as the health outcome, with a target of 10-6 DALYs per person. Source: Norovirus may be present in laundry greywater if member(s) of the household are infected and/or ill. The concentration of norovirus in greywater was estimated using first principles. Barriers/controls: The norovirus disease burden from consumption of lettuce irrigated with untreated greywater (comprising both laundry wash and rinse waters) was compared with the implementation of two control measures: cessation of irrigation prior to harvest (withholding period) and washing of lettuce prior to consumption. Intake: The assumed amount of norovirus ingested during exposure to greywater was determined based upon the estimated volume of greywater indirectly ingested when consuming greywater irrigated lettuce and the concentration of norovirus in the greywater. It was assumed that people ate 23.8 g of lettuce per day on 251 days per year, and that greywater was retained on lettuce leaves after irrigation. where Rvirus is the viral log10 reduction on fabric due to washing and Vlaundry is the volume of water in a laundry load (mL). On days where no members of the household are ill, the norovirus concentration of greywater is zero (i.e. zero risk of infection). The number of people in the household that are ill on a given day (O) was estimated using information about the seasonal incidence of household outbreaks (number of outbreaks per month), the number of people infected during a given outbreak (maximum of 4), and assuming that infected individuals shed norovirus for 28 days once they are infected. Using this information, we estimated the greywater concentration for 365 days of the year for 10,000 households. There were an estimated 545 outbreaks over a 12 month period for the 10,000 households (5.3% of households had at least one outbreak over the 12 months); therefore, the majority (>99%) of the daily greywater concentration estimates are zero. For example, if a household had an outbreak in January (31 days) with 2 people infected, 28 days of the month would have an estimated greywater concentration where O=2, and 3 days of the month would have a concentration of zero. where w is the log10-reduction in virus concentration from washing of lettuce prior to consumption, k is the in-field virus kinetic decay constant (per day), and t is the withholding period (days), i.e. time between last greywater irrigation event and harvest. where 1F1 is a confluent hypergeometric function. where pk is the kth daily probability of illness per exposure event and d=215 days of lettuce consumption per year. A total of 10,000 annual values were calculated. To incorporate uncertainty and variability, a Monte Carlo simulation with 365 days per year for 10,000 households (total of 3,650,000 iterations) was implemented, using the distributions described above and descriptive statistics (median, 90th and 95th percentile values) were determined. To simplify the model, uncertainty in the days of shedding, lettuce consumption (mass and frequency), and dose-response relationship were not accounted for. Annual risks were compared against the 10-6 DALYs per person per year health target. Using the median value, greywater reuse met the DALY health target; however, using the 95th percentile values, all scenarios exceeded the health target, including those with additional controls of produce washing and withholding periods (Table 1). This highlights the importance of considering which statistic to use in the analysis of risk. It is important to consider the findings of the QMRA model within the local context. As detailed in the WHO Sanitation Safety Plan (WHO 2016), it is important to consider all exposure and transmission routes. In this case study, while not part of the sanitation system, person-to-person secondary transmission of norovirus may contribute to infection and illness, with reports of 14% secondary attack rates in households with an infected individual (Alfano-Sobsey, Sweat et al. 2012). If it is assumed that irrigated lettuce is consumed only by members of the household, the relative risk from consumption of irrigated lettuce should be considered alongside the risk from exposure within the household. Table 1. QMRA results for annual probability of infection per person per year and disability adjusted life years (DALYs) per person per year, reported as median [90th, 95th], for each scenario. While the reuse of greywater for irrigation of lettuce exceeded the health target when using the 95th percentile values, the health target was easily met using 90th percentile values. Given the context of other household exposure pathways (detailed above), the risk from consumption of greywater irrigated lettuce is low. While the use of controls, such as produce washing are recommended, they had a small impact on the estimated disease burden associated with consumption of greywater irrigated lettuce. installation of a greywater treatment system. This study demonstrated that greywater irrigation of vegetables meets the 10-6 DALY health target for 90th percentile estimates. If the aim was to meet the health target at 95th percentile values, additional controls would need to be evaluated as produce washing and a 2 day withholding period were not sufficient. Regular monitoring of pathogens, or even faecal indicators, may not be practical due to the costs associated with sample collection and analysis. As a result, there may be instances where an assessment of risk is required but no local pathogen data are available. This case study demonstrated how to use first principles and existing published data to estimate pathogen concentrations as part of exploratory assessments of risk. Some of this data can be found in the GWPP chapters [*insert links**]. The use of first principles provides a useful approach to estimating water quality data in the absence of measurements; however, it is very important that model inputs and assumptions are clear and transparent to ensure that the estimates of risk are understood within the appropriate context. For example, while uncertainty and variability were accounted for in this case study by using distributional assumptions, the model results are limited by various assumptions including household size (assumed to be 4) and composition (the outbreak study was conducted in households with 2 children). Further, the broader context of risk should be assessed when conducting a QMRA, which, in this example, includes other pathways of norovirus exposure (i.e. within household person-to-person contact) which may be greater risks of transmission and infection. Barker, S. F., J. O'Toole, M. I. Sinclair, M. Malawaraarachchi, K. Leder and A. J. Hamilton (2013). "A probabilistic model of norovirus disease burden associated with greywater irrigation of home-produced lettuce in Melbourne, Australia." Water Research 47: 1421-1432. [Anonymous] (2016). Sanitation safety planning - manual for safe use and disposal of wastewater, greywater and excreta. Alfano-Sobsey, E, Sweat, D, Hall, A, Breedlove, F, Rodriguez, R, Greene, S et al. (2012). Norovirus outbreak associated with undercooked oysters and secondary household transmission. Epidemiology and Infection. 140, pp. 276-282. Gibney, K, O'Toole, J, Sinclair, M and Leder, K (2014). Disease burden of selected gastrointestinal pathogens in Australia, 2010. International Journal of Infectious Diseases; IJID. 28, pp. 176-185. Teunis, P.FM, Moe, C.L, Liu, P., Miller, S.E, Lindesmith, L., Baric, R.S et al. (2008). Norwalk virus: how infectious is it?. Journal of Medical Virology. 80, pp. 1468-1476. Teunis, P.FM, Nagelkerke, N.JD and Haas, C.N (1999). Dose response models for infectious gastroenteritis. Risk Analysis. 19, pp. 1251-1260.